Welcome to the "How in the hell do I get that Damned console to work in Soldier of Fortune" tutorial. For those people who are almost completely hopeless, I will now attempt to explain this very simple thing in the most ridiculously detailed way that I can. Here it goes, enjoy! Find your Soldier of Fortune shortcut. This is the little object that you double-click with your left mouse button to start Soldier of Fortune. It is usually labeled "Soldier of Fortune" or "Soldier of Fortune Platinum", depending on what version you have. 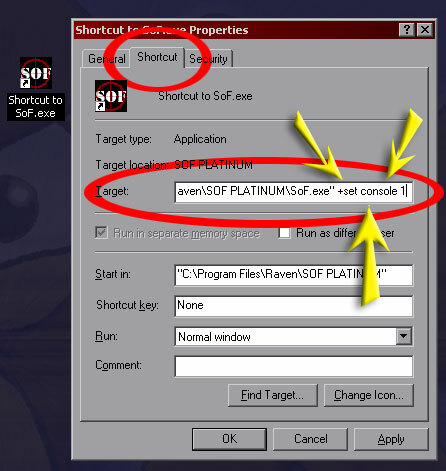 For this example, mine happened to be labeled "Shortcut to SoF.exe". Don't worry, what we do here will still work if you have one of the other names. 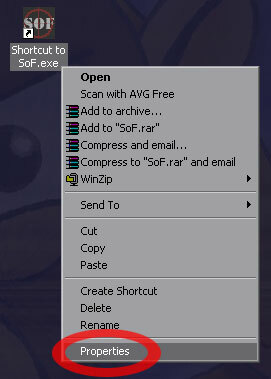 The shortcut, usually on your Desktop, will look very much like the following picture. Test the Soldier of Fortune shortcut to make sure that it works. If Soldier of Fortune starts when you double-click on the Soldier of Fortune shortcut with your left mouse button, then the Soldier of Fortune shortcut is good and we can continue to step three (3). If the Soldier of Fortune shortcut does not work, post in the forums so we can help (make fun of) you. Right click on the Soldier of Fortune shortcut. That means "Place your mouse cursor over the Soldier of Fortune shortcut and click the right mouse button once." This action will cause a menu to pop up. When that happens, move your mouse cursor down the list until you reach "Properties." Now click on "Properties" one (1) time to open the Soldier of Fortune shortcut's "Properties" window. OK, guys and gals. Now it gets "tricky." At the top of the "Properties" window for the Soldier of Fortune shortcut, you will see three (3) or more "tabs." Each "tab" represents another "page" in the "Properties" window. You need to be on the "Shortcut" page inside the Soldier of Fortune shortcut's "Properties" window (also known as a "dialog", but I don't want to confuse anyone. So I'll keep calling it a window.) Click on the "Shortcut" tab one (1) time with the left mouse button to be sure that you are on the correct page of the Soldier of Fortune shortcut's "Properties" window. 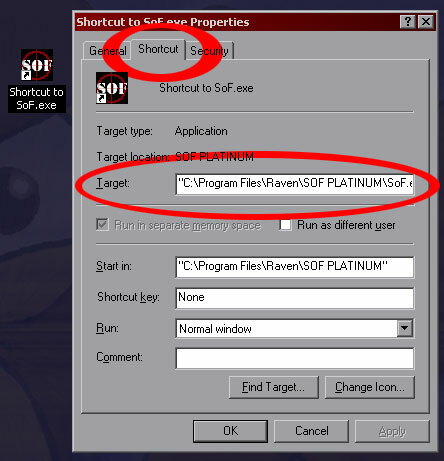 We will be modifying the "Target:" field on the "Shortcut" page of the Soldier of Fortune shortcut's "Properties" window. Take a very close look at the following picture to make sure you are in the right place. Remember, the full path located within the quote ( " ) marks may be different if you have a different version of Soldier of Fortune or if you installed in a different directory. That's it! Just place the mouse cursor over "OK" or "Apply" and click it with your left mouse button one (1) time to save the changes to the Soldier of Fortune shortcut. Now when you start Soldier of Fortune by double clicking the Soldier of Fortune shortcut with your left mouse button, you will be able to open that magical console whose glorious might you have heard so much about. To open and close the console, simply press the tilde ( ~ ) key while in-game. The tilde ( ~ ) key is located above the "tab" key and just left of the "1" key (not the (1) key on the keypad located on the right side of the keyboard, but the (1) located on the left side of the keyboard!). You could sell your computer and learn how to read something called "books". You could pray to whatever sacred deity you worship for enlightenment. Or, you could visit our forums and ask for more help. Whatever the case may be, please visit our forums and give some feedback. It would be appreciated.